Well, I've been pretty productive in my woodworking since my last blog. Let's get started by discussing the nightstand project. In the photo at left I decided to try to do unevenly spaced dovetails. This may have been foolhardy to attempt for my first try but what the heck. 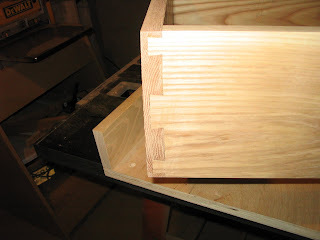 I like this because it distinguishes the joinery from most machine cut dovetails which are normally evenly spaced. In reality, these are no more difficult to cut than even spacing and I prefer them aesthetically. I must say that I was surprised at how the glue helped to hide some of the minor gaps in the joinery. I'm using Pro-Bond stainable PVA glue which is not normally a gap filling glue but for thin gaps I guess it works quite well. I screwed up the other side of this drawer quite royally and have some huge gaps. That's why there's no picture! Suffice to say that don't be stupid and always chisel to your base line, never beyond! I added this picture as a straight comparison to the picture from my previous blog to show how the glue helps to close up the joints. I'm very pleased at how this joint in particular turned out. Cut the tails on both sides first. By laying out and cutting both sides first you extend the endgrain layout lines across two boards which makes them longer and and is a better guide for your saw. This helps to make the tails the size across their depth which I feel is one of the biggest problems to overcome in this type of joinery. Now over the weekend, my wife got frustrated that it was taking me so long to finish the nightstand that some of her wish list items weren't getting done. 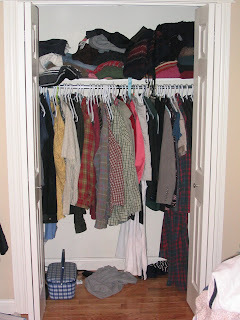 Specifically some shelves for my 15 year old son's bedroom and a closet organizer for our master bedroom. After much deliberation (actually she just decided and told me) we bought some cheap pine shelves and painted them to match our son's room. My wife even volunteered to paint them which was great and had them all painted wehn I got home on Saturday from helping a friend split some firewood. Unfortunately she painted the shelves on my workbench without covering the bench which was not so great. Anyway my bench is nothing too special so I can scrape the paint off without too much consternation. For the closet organizer we bought 2 sheets of 5/8" MDF. I spent probably 8-10 hours woodworking, painting and installing and I'm pretty happy with the results. Here are the before and after pics. 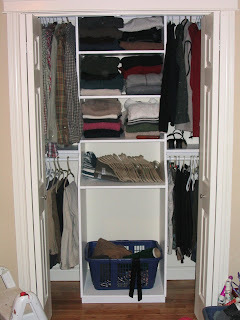 I intend to install 4 drawers in the space where the hamper is. I'll use full extension drawer slides and baltic birch plywood for the boxes. 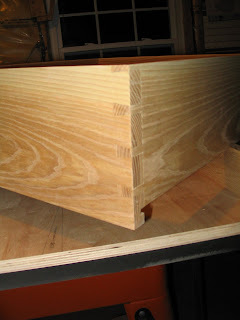 For the front of the drawers I think I'll do a small frame out of alder with a beadboard panel. Well that's it for this post. I was going to keep going on the drawers this week but It turns out than my hardwood supplier is out of 5/4 ash so I bought a nice big piece of red oak for the nightstand top. I'll try and get some pictures of laying out the panle glue up for you guys (and gals). Teds Woodworking has over 16,000 woodworking blueprints with STEP-BY-STEP instructions, pictures and blueprints to make all projects simple and easy!! !